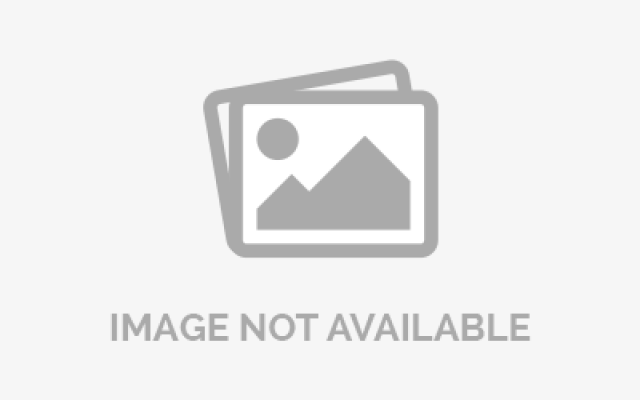 The Joint Admissions and Matriculation Board has listed items which it said remained prohibited for the over 1.8 million candidates taking the 2019 Unified Tertiary Matriculation Examination. The board has warned that candidates who breach the directive would be disallowed from taking the UTME. 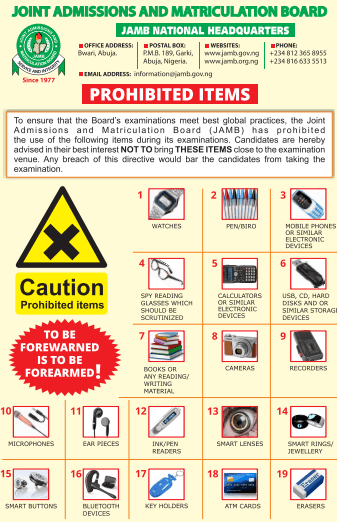 Candidates are hereby required to properly examine the list and take note of the prohibited items, in order to avoid complications during the UTME exercise. whizmonerics: Come o does it mean de will give us pencil i dun understand..
Samhenny: They should also ban wearing of clothes Sick bloodclats! JATTO: This is total nonsense. Luna: What if jamb sets questions on logarithm,how will we use the calculator on the system?? Adroit: jamb make una jeje with us oo. I'm gonna go with my glass on de day of my exam bcuz my glass z nt scrutinise but my fone & other tinx NO! i conquer, I'm not gonna go with dem. I heard some pple has form de habit of standing dere in de name gud "Samaritan s"& wen u mistakely handover ur belongings to dem hmmm. my bro/sis wen u will be through with ur exams, dere will turn into a tin air, dere will be no where to be found again. SO LET'S BE WISE!! will they now give us biro??? Uche: who will give us pencil? jamb? Great Olisah: Generalvicky, I don't think you' re a science student. Without any provision for calculations, i dont think any science student can do very well in JAMB. Uche: General vicky, writing materials won't be needed keh? If youre not calculating speak for yourself now. Why will it not be necessary? abi they told you they'll let you access google or youtube for any difficult calculation? Marzuq: Una fi ans question on electrons witout cal. Joanna: Really? ?,what about physics calculations,I remember when i asked this questions in my cbt training,and the teacher told me the questions jamb give nowadays are straightfoward,try to do the calculations in ur head, but i pray a sheet of paper will be given during the exam for calculations. Davefresh: yes, but you'd still need your pen and peper when solving. Hayplux3427: Go with a pencil... You'll surely be provider with a sheet of paper or two. tizkid: What Biro can write what can't a pencil write, or una no dey see pencil writings? no pen wettin i go take solve physics!?? Abigail peter: pls can u go with your phone to the exams center? Please when will Jamb Reprinting start? As a Science student if i want to find the Log of a number,Cos,Tan,Permutation,Cosine,Base of a number,e.t.c. What will i do because i know the calculator in the system does not have these special keys.I guess they want us to fail!! These guys are crazy... no pen/pencil? what about me that uses reading glass? habba we science students don hear am! how we go use calculate ni? shedrachmorganonah: And how would they check the glasses to see if they are spy glasses. tizkid: We are living in a modern world... Smart ring is available... Una no dey watch Hollywood?